﻿ Ephesians 4:9 (Now that he ascended, what is it but that he also descended first into the lower parts of the earth? But what does "He ascended" mean except that He descended to the lower parts of the earth? Now what does this "he went up" mean except that he also had gone down into the lower parts of the earth? And what is the ascended, except that he also first descended into the lower parts of the earth? (Now this, He ascended, what is it but that he also descended into the lower parts of the earth? [But He ascended?] Now what can this, He ascended, mean but that He had previously descended from [the heights of] heaven into [the depths], the lower parts of the earth? (But what does "He ascended" mean if not that He also [first] descended to the lower parts of the earth [i.e., to the earth below]? [Note: Of the three principal interpretations given to this verse: a) Christ descended to earth, b) Christ descended to the grave, c) Christ descended to Mary's womb. The first is to be preferred. See John 3:13; 6:38, 62]. But this He ascended what does it mean, but that he also descended into the lower earthly regions? (In saying, "He ascended," what does it mean except that he had also descended into the lower parts of the earth? now his having ascended, what does it mean, but that he had descended into the lower parts of the earth? But that he ascended, what is it but that he also descended into the lower parts of the earth? But what is that which ascended, except that which descended into the lower parts of the earth? What does "he went up" mean, except that he had first gone down to the under parts of the earth? (Now that he ascended, what is it, but that he also descended first to the lower parts of the earth? (And so having ascended, what is it except that he also descended first into the lower parts of the earth? Now "he ascended," what is [it], except that he also descended to the lower regions of the earth? That he ascended: what meaneth it, but that he also descended first into the lowest parts of the earth? What does he ascended mean, except that he first descended to the nether regions of the earth? 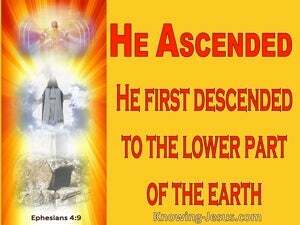 Now surely this "he ascended" implies that he also descended into the lower part of the earth. Now what is the meaning of "he ascended," except that he also descended to the lower regions, namely, the earth? Now this, "He ascended," what is it but that he also descended into the lower parts of the earth? Now what is implied in his ascending, but that he also descended into the lower parts of the earth? But this, that he ascended, what is it but that he first descended into the lower parts of the earth? Now this, He ascended; what is it, - save - that he also descended into the under parts of the earth? Now this, that he ascended, what does it imply? but that he also first descended into the more internal parts of the earth? Now surely this 'going up' must imply that he had already gone down into the world beneath. (Now this "re-ascended" --what does it mean but that He had first descended into the lower regions of the earth? What does "He went up" mean, except that He had first gone down into the lower regions of the earth? Now this, "He ascended," what is it but that he also first descended into the lower parts of the earth? 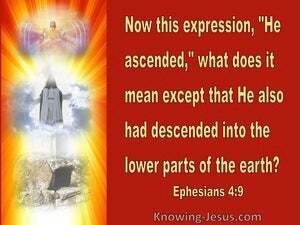 Now the word, "He ascended," what does it mean, but that He also descended into the lower parts of the earth? 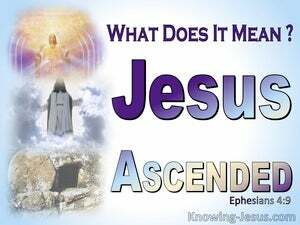 Now this expression "He ascended" what does it mean, but that He descended first into the lower parts of the earth? and that, he went up, what is it except that he also went down first to the lower parts of the earth? And no one has ascended up to the heaven but he that came down from the heaven, even the Son of man, who is in the heaven. For the bread of God is he who descended from heaven and gives life unto the world. But those that sought my soul, to destroy it, descended into the lower parts of the earth. for as Jonah was three days and three nights in the whale's belly, so shall the Son of man be three days and three nights in the heart of the earth. And the LORD came down to see the city and the tower, which the sons of the man built. And the LORD came down upon Mount Sinai, on the top of the mount, and the LORD called Moses up to the top of the mount, and Moses went up. For thou hast made him a little lower than the angels and hast crowned him with glory and beauty. My body was not hid from thee, even though I was made in secret and brought together in the lowest parts of the earth. Who has ascended up into heaven, or descended? who has gathered the wind in his fists? who has bound the waters in a garment? who has established all the ends of the earth? what is his name, and what is his son's name, if thou canst tell? Sing praises, O ye heavens; for the LORD has done it; shout with joy, ye lower parts of the earth; break forth into praise, ye mountains, O forest, and every tree therein, for the LORD has redeemed Jacob, and in Israel he shall be glorified. For I came down from the heaven, not to do my own will, but the will of him that sent me. The Jews then murmured of him because he said, I AM the bread which descended from the heaven. I AM the living bread which came down from heaven; if anyone eats of this bread, they shall live for ever; and the bread that I will give is my flesh, which I will give for the life of the world. This is the bread which came down from heaven; not as your fathers ate manna and are dead; he that eats of this bread shall live eternally. What if ye shall see the Son of man ascend up where he was before? for the Father himself loves you because ye have loved me and have believed that I came out from God. Jesus said unto her, Touch me not, for I have not yet ascended to my Father; but go to my brethren and say unto them, I ascend unto my Father and your Father, and to my God and your God. Thou didst make him a little lower than the angels; thou didst crown him with glory and honour and didst set him over the works of thy hands. But we see this same Jesus, crowned with glory and honour, who was made a little lower than the angels for the suffering of death, that he by the grace of God should taste death for every man.